Xurkitree in game: 359 Who? Important notice! 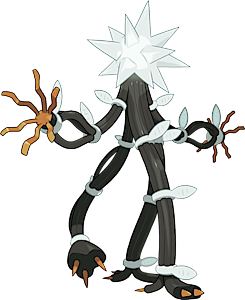 Pokemon Xurkitree is a fictional character of humans. Xurkitree (Japanese: ?????? Denjumoku) is an Electric-type Pokémon introduced in Generation VII. It is one of the Ultra Beasts and is known by the code name UB-03 Lighting (Japanese: UB03 Lightning). Xurkitree is a very tall Pokémon that resembles a vaguely humanoid mass of electrical wiring. Its head is a white, brightly glowing "star" with numerous points and no visible face. Below its head is a mass of black cables that separates into five limbs, each one a bundle of three cables bound together by three white, glowing objects that resemble zip-ties or Christmas lights. Its two arms have their cables separated between the two outermost ties, and end in copper structures that resemble hands, each with six flat "fingers". Its two legs each have no loose cables and end in feet with three toes possessing "claws" of exposed copper; its left foot has two toes fused together, while its right foot has all three toes separate. Finally, its tail has one loose cable in two sections and ends in what resembles a three-pronged plug; with this, it "plugs" its tail into the ground when it uses electric attacks. The cables that make up its body have been noted as being made of the same material as electrical wiring, and as such are highly efficient conductors of electricity. Its body contains an organ that produces energy, and it can discharge up to 1,000,000 volts at once. Because this Ultra Beast reportedly raided a power plant, it is speculated to sustain itself with electricity. This is supported by observations that it will "plug" its limbs and tail into the ground when it is low on energy, entering a tree-like state to absorb electricity from the earth. Witnesses claim that its entire body crackles with astonishing electrical power. Xurkitree is the tallest Electric-type Pokémon. Xurkitree is the only single-type Ultra Beast. 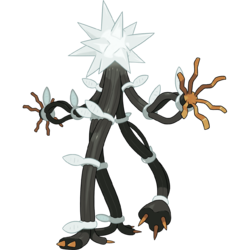 Xurkitree appears to be based on a humanoid structure of sparking electrical wires and power lines. It also shares some small aspects of a tree. Denjumoku may be a combination of ?? denki (electricity) or ?? denji (electromagnetism) and ?? jumoku (tree).